NASA's solar-powered Juno spacecraft, the centerpiece of a $1.1 billion mission to Jupiter, has been mounted atop an Atlas 5 rocket, setting the stage for launch Aug. 5 on a five-year voyage to the solar system's largest planet. Once in orbit around Jupiter's poles, Juno's instruments will precisely map the planet's gravitational and magnetic fields, probe its turbulent atmosphere and hidden interior and study the mechanisms responsible for its powerhouse auroras, the strongest in the solar system. "Jupiter probably formed first, it's the largest of all the planets, in fact it's got more material in it than all the rest of the solar system combined," Scott Bolton, Juno principal investigator at the Southwest Research Institute in San Antonio, Texas, told reporters Wednesday. "If I took everything in the solar system (except the sun), it could all fit inside Jupiter. "So after the sun formed, (Jupiter) got the majority of the leftovers. And that's why it's very interesting to us. If we want to go back in time and understand where we came from and how the planets were made, Jupiter holds this secret, because it got most of the leftovers after the sun formed, and we want to know that ingredient list. What we're really after is discovering the recipe for making planets." Braking into orbit around Jupiter in July 2016, Juno will swoop to within 3,100 miles of the gargantuan planet's cloud tops once each orbit to collect precise data about its magnetic and gravitational field strength. But it will do so in an orbit around the planet's poles, ducking below the intense radiation belts that concentrate high-energy sub-atomic particles around the equator. "So not only are we over the poles, but we're getting closer to Jupiter in our orbit than any other spacecraft has gone," Bolton said. "We're only 5,000 kilometers above the cloud tops and so we're skimming right over those cloud tops and we're actually dipping down beneath the radiation belts, which is a very important thing for us. Because those radiation belts at Jupiter are the most hazardous region in the entire solar system other than going right to the sun itself." Even in a polar orbit, Juno will be exposed to the equivalent of 100 million dental X-rays over one year, according to a NASA mission overview. To survive the hellish environment, the spacecraft's electronics are housed in what amounts to a titanium vault. "We're basically an armored tank going to Jupiter," Bolton said. But exposure to even reduced levels of radiation will limit the spacecraft's useful life to about one year, or 33 orbits. At that point, Juno will be ordered to crash into Jupiter's atmosphere, going out in a literal blaze of glory. Built by Lockheed Martin Space Systems of Denver and managed by the Jet Propulsion Laboratory in Pasadena, Calif., Juno will be the ninth spacecraft to study Jupiter and only the second to orbit the huge world. All of the earlier spacecraft were powered by radioisotope thermoelectric generators, or RTGs, which used thermocouples to convert the heat produced by radioactive decay into electricity. Juno is the first solar-powered spacecraft designed to operate at Jupiter's distance from the sun -- nearly 500 million miles -- where sunlight is 25 times weaker than at Earth. As a result, three huge solar panels were required, each one the size of a tractor-trailer, arranged starfish fashion around the central body of the spacecraft. At Earth's distance from the sun, the arrays would generate 14 kilowatts of power. At Jupiter's distance, they will provide just 400 watts to power Juno's science instruments and subsystems. Perched atop a United Launch Alliance Atlas 5 rocket, Juno is scheduled for blastoff from complex 41 at the Cape Canaveral Air Force Station at 11:34 a.m. EDT (GMT-4) on Aug. 5. The Atlas 5 is not powerful enough to fling the spacecraft directly to Jupiter. Instead, Juno will fly past the orbit of Mars and then use on-board propulsion in September 2012 to drop back into the inner solar system for a velocity boosting Earth flyby on Oct. 12, 2013. That will give Juno the extra push it needs to reach Jupiter in July 2016. The primary goals of the mission are to use the solar system's largest, and presumably oldest, planet to answer fundamental questions about the evolution of the early solar system and the processes at work in the hidden hearts of gas giants like Jupiter, Saturn, Uranus, Neptune and scores of others discovered around distant suns. Determining how much water may be in Jupiter's atmosphere, a key factor in theories about how the solar system first formed and the distribution of elements in the solar nebula. To measure the composition, temperature and the motions of clouds deep in Jupiter's atmosphere. To characterize the magnetic and gravitational fields to learn more about the interior structure of the planet and whether a solid core might be present. To study Jupiter's magnetosphere and the intense auroras at the planet's poles to learn more about the planet's magnetosphere and its effects on the atmosphere. "Early in the solar system, the sun forms and the leftovers start to expand and cool," Bolton said. "And the first molecule that probably gets developed is water, because the hydrogen is combining with the oxygen. Combining two hydrogens may be more common, but the first multi-element molecule is probably water. "Now water ice is very efficient at trapping other heavy elements, and this is really the theory of how we think the solar system and the planets formed, is that the water ice started to cluster together, trapping heavy elements, forming something called icy planetesimals. These are, if you will, really tiny little dirty ice balls. When Jupiter starts to come together, the growing theory among most models is that as it brings in this leftover debris, it brought in a bunch of these icy planetesimals. ... This is sort of the theory about how Jupiter got enriched (with heavier elements)." But data from the Galileo mission suggested the abundances of various heavy elements is different from levels found in the sun and in interstellar gas clouds. "What you were left with is the volatility, or how easily these things get trapped inside the ice, doesn't seem to matter, they all got trapped the same, the same enrichment, even though the abundances of these things in the sun and in the interstellar space is very different," Bolton said. "So we were left with a puzzle. "This ties to us directly because the stuff that Jupiter's enriched in, these heavy elements, everything heavier than helium, is what we're made out of, it's what the Earth's made out of, it's what all life is made out of. We're trying to figure out what that history was early in the solar system of how these things got into Jupiter and how the planets got more of them than the sun did, because it obviously led to us." The amount of oxygen Juno detects in the atmosphere of Jupiter will provide a more refined sense of how much water ice contributed to the planet's formation. "The water measurement is a discriminator among these theories and will constrain which models move forward and which ones don't," Bolton said. "If there's a lot of water, it means one thing, maybe Jupiter formed farther out and migrated in. If there's less water, it may have (formed) closer." 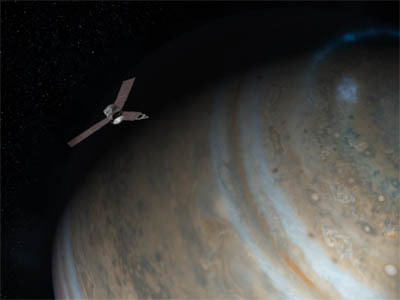 Another key objective is to figure out whether Jupiter has a solid, rocky core of some sort under the crushing weight of the overlying atmosphere and a layer of metallic hydrogen that may exist in a region where pressures range from 2 million to 40 million times the atmospheric pressure at sea level on Earth. "It's very different. I hesitate every time I say the word 'rock' because people think it's like a rock like we think of (on Earth) and it's not," Bolton said. "I don't really know what that is like, I have just as much trouble picturing 40 megabars as you do. ... Whatever's in the center of Jupiter is not like what we have on the Earth."